An additional $30 non-refundable artwork charge must be paid before work can begin. Add an additional $45 charge for logos or special type. Prices above are for a 1-color custom imprint on 1-side. Contact us for pricing on more than 1-color or 1-side printing. 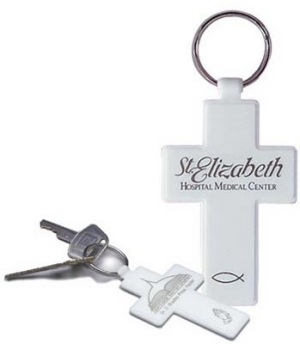 Item #RLWAC360 - 1-7/8" w x 3-1/8" h.
Cross Key Tags come in white only with gold imprint. Special optional symbols (shown below) can be added upon request at no extra charge. Imprint area is 1-1/2" w x 1/2" h. No eyelet to open, so keytag will never come apart. Includes tempered spring-steel split ring. Made in USA. 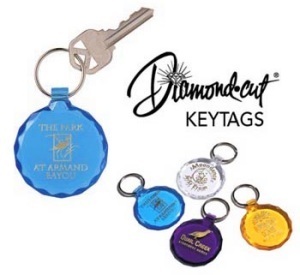 Diamond Cut Key Tags have the richness and beauty of precious stones...crafted into life in magnificent keytags. Comes in four sparkling, transparent and vivid gem colors: amethyst, aquamarine, diamond, topaz or assorted. The diamond cut recreates the hardness and clarity of precious stones with glittering precision-cut facets. No eyelet to open, so keytag never comes apart. Includes tempered spring-steel split ring. Imprint area is 1-1/4" w x 1-1/4" h in gold. Made in USA. 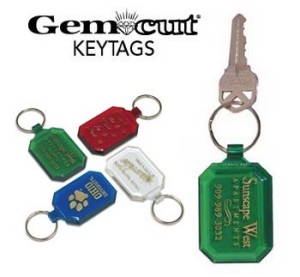 Gem Cut Key Tags recreate the clarity and hardness of precious stones. No eyelet to open, so keytag never comes apart. Includes tempered spring-steel split ring. Available in diamond, emerald, ruby, sapphire or assorted. Imprint area is 1" w x 1-1/2" h in gold. Made in USA. You can add any of the following optional symbols on our Cross Key Tags at no additional charge. Repetition is the name of the game to get people to see and learn your name. Once they are familiar with your name, they are more comfortable to vote for you or purchase your products and services. Increasing your Name Identification is the most important purpose of any advertising campaign. Key tags, key fobs are cheap advertising.